SO! 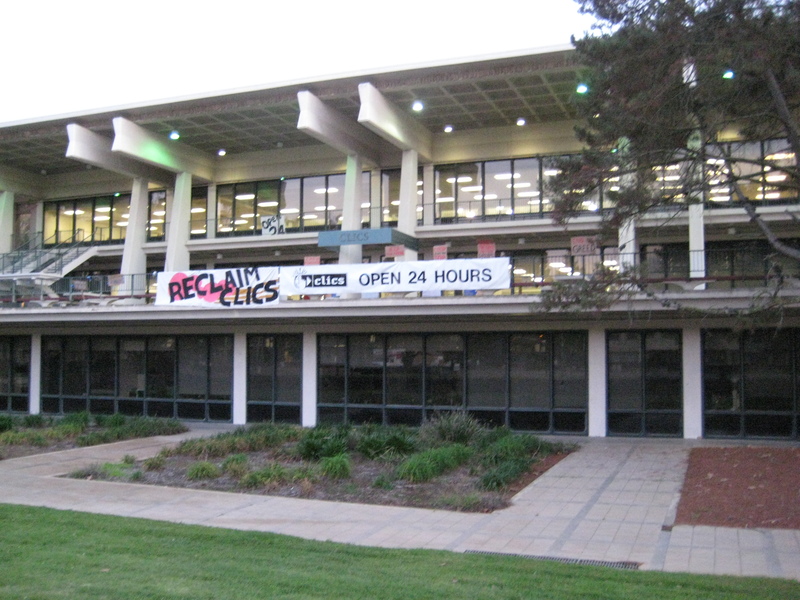 As some of you may or may not have heard, this past December The library known as CLICS (Center for Library Instructional Computing Services) on the campus of UCSD (University of California, San Diego) was involved in a small controversy as a group of students broke into the library as part of a movement called Reclaim CLICS. CLICS was closed at the beginning of this academic year (August 2011) as part of budget cuts. Too expensive to run, and the university didn’t want to adjust its budget to keep the library up, so in general the campus has had significant belt tightening across its broader library network. Study spaces on campus have gone down at a time when campus population has gone up (but housing has gone up), but all around I’d say it’s more of a nuisance then a crippling paralyzation. There are still a significant number of study spaces to be found, even during finals week as a number of libraries remain open. This wasn’t exactly a popular decision with the student population, but not so utterly horrific enough to spawn widespread campus protests. In spite of art projects on campus who’s budgets would’ve covered the library operating costs (I will note these were funded by private donations) and squabbles over pensions, payments, and research budgets, the only protests popping up on campus were small. UCSD is traditionally a campus of apathy – about the only issues that will spur campus riots (enough tension to fill the entirety of library walk, which would be several thousand students) are anything involving a significant and quick hike in tuition. I should know, I had a lecture once just off library walk where for a full hour we had a several thousand strong crowd filling library walk. 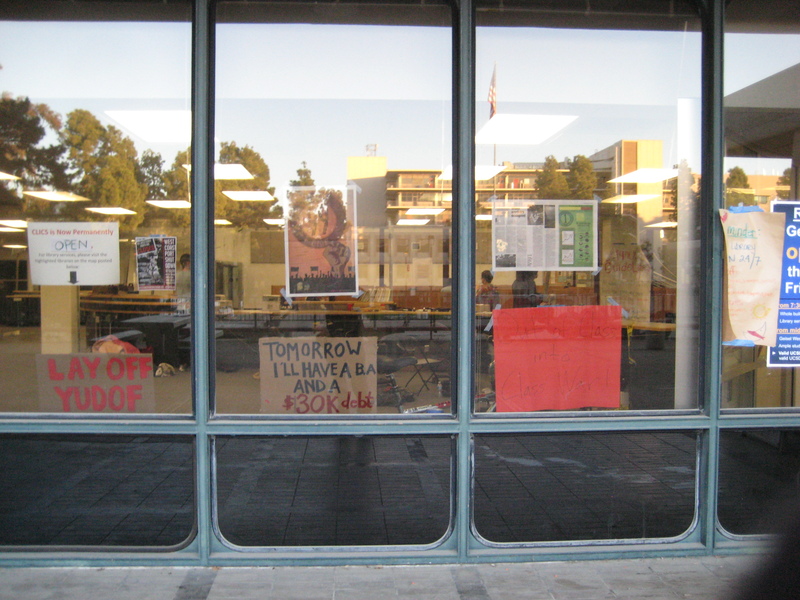 Leading up to the break in, the Occupy Movement had a number of small, token rallies in front of Giesal Library, the symbol of campus as well as the largest library. I was at most of them, and they only drew crowds of several dozen to under one hundred. I’ll share some of the photos and video I took another day. while passionate, they were small, and actually had a small, dedicated hangers-on contingent of counter protesters in the Young Americans for Liberty who showed up as frequently as I did, if not more. Also, in 10th week, I was led to understand that Giesal library would be open for 24/7 study to replace CLICS’ old function as a university response to student fussing. All this prior to the break in. So why all this setup? The poor, downtrodden students were savaged by the big bad mean university who didn’t care about study spaces. 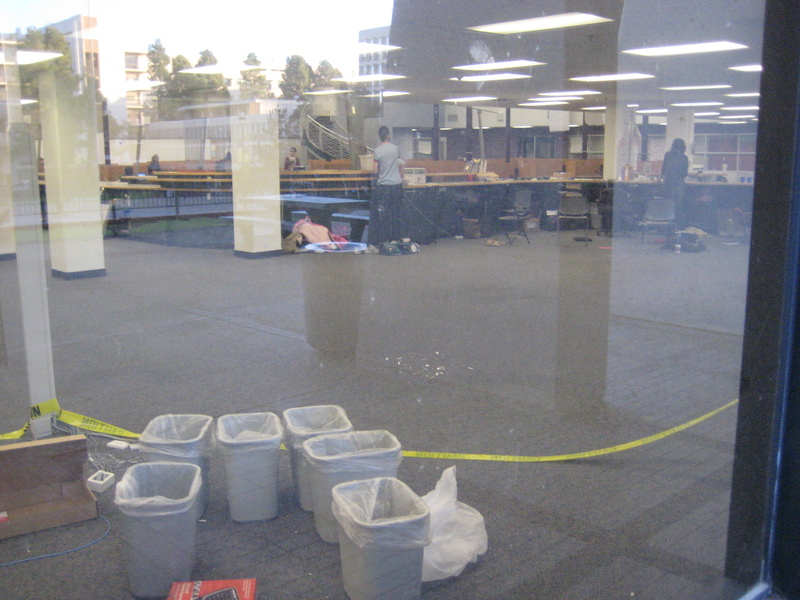 The students reclaimed CLICS because they were FORCED too and had nowhere else to study! There was absolutely no political agenda whatsoever these were just poor, sad, students trying so hard not to fail! Full gallery here. Selections below. CLICS is on the 2nd story in this photo. Read the signs if you can. Not family friendly! A view inside from outside, looking in from behind the front desk. It’s a bit messy in there. How much do I need to say? 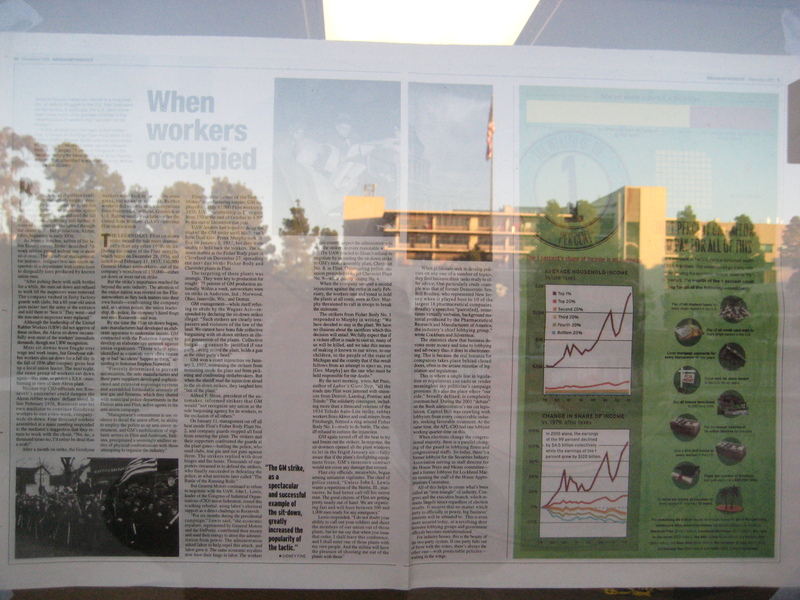 That is a bona fide socialist newspaper posted on the window of a former library at a public university. Rules suggesting, amongst other things, that cameras inside are bad things. Have something you’re hiding, guys? Why would poor, sad, failing students want to loudly shout a radical agenda and in the same breath tell each other to not talk to the police or media? Take note of the rules list asking visitors to pretty please don’t take interior pictures. There was a table inside that was covered in a small blanket of books on socialism, marxism, etc. No story I read mentioned the political agenda nor any whisper of the ties of this Reclaim CLICS group to the larger Occupy Movement. NONE. AT ALL. Why did the university let individuals breaking and entering into university property have free run of the place? Why were radical political messages allowed to sit on university property for roughly a week? Why were police actively discouraged from being present? Who is this group, why are they promoting occupy, and why do they really seem like they’re hiding something? Now I also failed to do my job. I wasn’t expecting such an utter news blackout of the agenda behind the break in. I should have actually gone inside, conducted informal interviews, done a little infiltration, taken more photos, followed the progression of the signage over time. Unfortunately, life interfered as well as the little fact that I only have so much time and energy to devote to citizen journalism. For that, I apologize. Since this is in essence an incomplete report – I’ll let it stand as is, and provide more in depth commentary either at another time or in response to any comments below. Just do me a favor – agree or disagree with what these people did, answer this question for me: Why hide what was actually done? If it’s so noble and right, WHY HIDE?? I am actually typing this report in CLICS itself. That’s right! It remains open. It’s also been rather thoroughly scrubbed of any and all propaganda and messaging. This is good. This means I can happily come in and study, research, write, etc. without having to worry about the radical agenda thought police looking over my shoulder and wondering if I’m running my webcam to record what’s going on inside. It also means that the University is finally acting as a parent and keeping a tighter hold on the place as it should. If CLICS is kept open and is run as a non partisan, -actual- study space and not a little den of extreme leftist proganda dissemination I can happily support it being run by students as it is now. But it has to stay clean. Keep the politics out of it, don’t be so darned sneaky and underhanded, and maybe. JUST maybe, you’ll have a chance at reaching out to people. I’m here now. I will be as long as it remains as it is while I sit here and tap away. Almost all by my lonesome.. makes one wonder about that severe need for study spaces, huh? It is always refreshing to see independent journalism, even (especially?) from a political perspective I am often insulated from. So thank you for that. Its not worth while for me to try to justify the break-in to you since, any justification would rely on political assumptions I suspect you would not accept. 1. Why did the university let individuals breaking and entering into university property have free run of the place? I don’t know for sure, but I expect the University was afraid of re-enacting a UC Davis/police violence media blitz. 2. Why were radical political messages allowed to sit on university property for roughly a week? Same as above. Also, I think the free-speech code on campus specifically prohibits content-based discrimination regarding posting. For instance, one is allowed to put up posters advocating the over-throw of capitalism, or the over-throw of market regulation any where posting is allowed on campus. 3. Why were police actively discouraged from being present? 4. Who is this group, why are they promoting occupy, and why do they really seem like they’re hiding something? 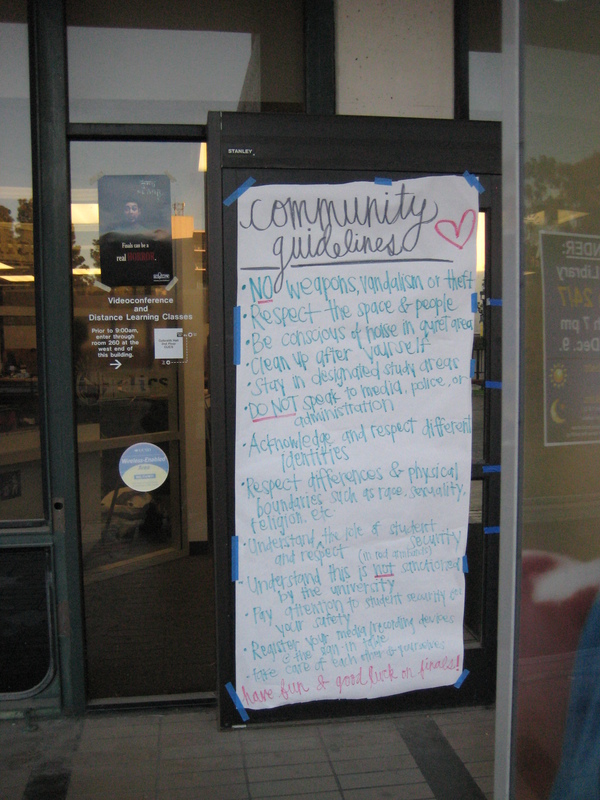 The group was a complicated coalition of progressive UCSD students. They were interested in keeping their identities anonymous from police and the media because it was worried that it would be a legal liability. The ‘reclamation’ of CLICS was poorly publicized, and the location of CLICS is admittedly out of the way. Nonetheless, a petition supporting the re-opening of CLICS as a student-run space was endorsed by over 1,200 signatures. Long answer, but I think going the extra length to try and break down barriers between right and left is worth it. I appreciate you taking the time to respond, particularly in the lengthy way you did. I want to actively encourage an open forum on my website regarding ideas, especially those I disagree with! I want to encourage you to try! -I- might not agree with it, but I’ll listen to your reasoning, and I’ll encourage my audience to do the same. My goal here is to try to dissect this situation, understand motivations, and broadly I want to try to find points of agreement with some in the occupy movement so that folks like me – independent conservatives – and occupy sympathizers and participants – more liberal sorts – can agree to address certain issues while setting aside others in the spirit of cooperation. I’d like to think it’s possible. I know in this case – I’m directly confronting Occupy – but in a way it’s because I think they could do -other things- as a movement that would get more people to like them. I said in my article that if they had really kept the whole thing clean – no political message – and labelled it ONLY as a charity thing for the campus at large – People would like it more. You would get more positive attention, people would associate the name ‘Reclaim CLICS’ with a positive bent rather then suspicion like I am. Then, later, when you did other events or rallies your footing would be more pure, if you would. The group would be more approachable, more palatable. Again, thanks for the reply, I look forward to more – and I want to remind you that I will not delete things I disagree with. If you’d like, I will offer you a guest posting with the goal of providing me and my audience your perspective so that they can decide on their own – a posting I would not edit save for spelling.